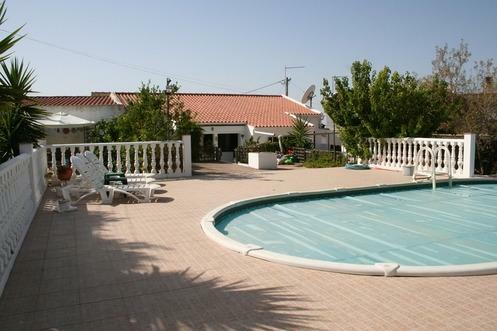 3 bed villa with pool and ruin, Sao Bartolomeu de Messines - Property for sale. Full Description: Outstanding opportunity!! This deceptively spacious 3 bedroom, bungalow style semi detached villa is located in a small village between Messines and Alte, very close to all amenities and a perfect retreat either for permanent living or relaxing holidays. The house was renovated by the previous owners and retains the thick walls to keep the property cool in the hot Summer months and warm in the Winter. Accommodation comprises an entrance hallway, lounge with wood burner, large dining room, fitted and equipped kitchen, 3 bedrooms with fitted wardrobes, shower room and guest w/c. Outside surrounding the swimming pool are numerous shaded seating areas in the low maintenance garden with mature shrubs, flowers and fruit trees as well as play areas for the children and the all important BBQ! There is a utility/laundry/storage building which the current owners have had plans drawn up for additional accommodation. Plus, also belonging to the property is a plot to the front with a ruin, again with plans for a 2 storey, 3 bedroom villa with pool. This is an exceptional opportunity and will not be available for long! Early viewing recommended. This listing has been viewed 741 times.